Article - We sell Amano time cards and ship to Miami. We sell Amano time cards and ship to Miami. We stock time cards for Amano MJR self totaling time clocks. 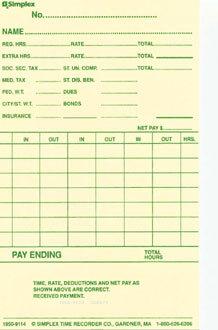 We also stock time cards for all other time card punch clocks. We normally ship the same day. Our prices are either equal to, or less than, what you are used to paying in the Florida area. Call us today, we will be happy to get your business, and will work to gain your ongoing trust. We have these, and many more, in stock.